It's worth a comment on oil prices which have been collapsing with remarkable speed lately. Firstly, let's briefly recap the price history of the last five years, which I have divided into eight eras in the chart above. The final stage of the 2005-2008 price shock. This was driven by the onset of the plateau in global crude oil production, together with a rapidly growing global economy. There was likely some speculative excess amplifying the late stages of the movement. 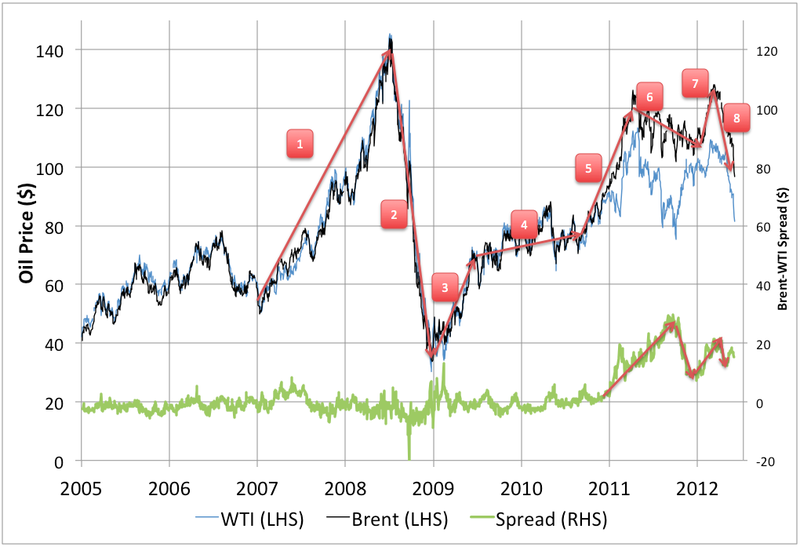 The massive collapse in oil prices driven by the 2008 financial crisis. A fairly quick recovery driven by modest cuts in OPEC output, particularly Saudi Arabia. 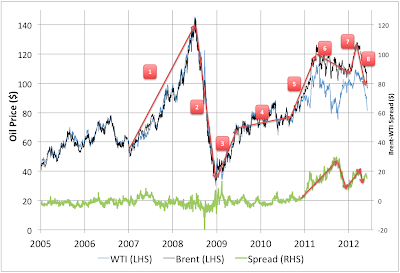 A period of fairly stable prices in H2 2009 and H1 2010 at a level that was (then) acceptable to OPEC. A sharp run-up in late 2010/early 2011 driven by the Arab Spring and in particular the loss of Libyan oil production. A gradual decline in prices as the Eurozone crisis heats up, raising fears over demand, and the situation in the Middle East seems to stabilize (except for Syria which is not a big oil producer). A short sharp rises in price as the LTRO operations appear to have stabilized Europe, and fears of an Israeli attack on Iran are aired extensively in the press. The recent sharp collapse in prices as it becomes clear that the LTROs were only a temporary palliative to the situation in the Eurozone, which continues to worsen. Meanwhile negotiations with Iran take an attack off the table for the time being. Furthermore, growth in major emerging markets (China, India, Brazil) has slowed. So whither these trends now? On the one hand, it seems clear that the recent downward forces on prices will continue: negotiations with Iran will drag on as the US administration is determined to postpone any attack till after the election, while Iran is determined to not give any more ground than it absolutely has to. Similarly, Spain's difficulties rescuing Bankia, and the fact that there are likely still a lot of not-fully-discounted bad loans in Spain's banks, suggest that the Spanish government is near the end of its rope. Meanwhile the tension between the Greek populace and international authorities is not resolved at all. Eurozone leaders at present still appear to have no serious strategy for addressing the problems. Spanish and Greek unemployment continue to soar. And then there is the continued inability of the polarized US political system to come to grips with major challenges - particularly the upcoming expiry of the Bush tax cuts and the automatic spending cuts that will be triggered around the end of this year. All this is chilling stock markets everywhere, particularly as no-one really knows what the implications for the global financial system will be if pieces start to fall off the Eurozone as it trundles forward. These kinds of considerations suggest that the downward break in oil prices could continue quite a lot further. On the other hand, with Brent falling below $100, we are now testing the current level of OPEC's tolerance for lower prices. In 2009/2010 they were willing to settle for $70ish without reducing production. However, since that time they - particularly Saudi Arabia - have signed up for extensive domestic stimulus programs to appease the population following the Arab Spring. Thus they almost certainly need somewhat higher prices now. Mr Al-Naimi has been quoted on numerous occasions in the last year saying that $100 was a fair price for oil. Will they cut oil production now, on that rule? Or wait till it crosses $90 or $80? I'd be surprised if it took $80 to get them to act. Thus I would expect that if the downward movement were to continue, it would not be too much longer before it would trigger a Saudi production cut. There is some possibility (as in 2008) that prices could transiently go lower particularly if events in Europe turn truly dramatic and markets start to panic. Then it takes a while for the effects of production cuts to work through the system. But then again, I would expect market participants to have learnt something from what happened in 2008 and be more prone to price in the effect of OPEC production cuts in advance. Further, once we are below $100 in Brent prices, there is considerable risk of upward surprises. A breakdown in the Iran talks, European authorities doing something relatively functional, Greek elections producing a pro-agreement coalition, hiccups of any kind in the global oil production system. In the long term, I think oil prices are certainly going to average over $100. In short, while prices could certainly go lower in the near term, they are at levels were, if I were an oil trader, I'd feel more comfortable being long than short unless my time-horizon was very short. If one were sitting in cash, there could be an argument for waiting a little longer before jumping in on the long side - at least while the situation in Spain seems quite so unresolved. Couldn't the Saudi's current need for cash (due to the Arab Spring) dissuade them from cutting production? After all, lower oil prices would also hurt Iran and if Saudi Arabia has to take a hit to their income they might as well try and use the opportunity to topple Iran's leadership (which they would dearly love to see toppled). James - since the Saud share of global production is likely higher than the elasticity of oil demand, I wouldn't expect them cutting production to reduce their revenue (relative to doing nothing). Say they are pumping 10mbd (in round numbers) and that's 1/9 of global production (also in round numbers). Suppose they cut 1mbd - that's a little over 1% of global production. Given an elasticity of 0.02 (to use the IMF number say) that leads to a 50% rise in price on the 9mbd they are still selling. They are way ahead. Even if you thought the elasticity was 0.05 they would still be ahead (20% rise in price on the 9mbd). what does LTRO stand for? In my opinion the peak oil theory as originally proposed by Hubbert has been misinterpreted. The peak oil community online comprised of websites like Oil Drum, ASPO and Early warning believes peak oil production will occur now. But in fact peak oil is tied to a particular production technology . So there is peak in oil produced with conventional technology from the 80s overlaid with the production possible with 3D seismic, overlaid with production possible with horizontal wells and fracking, overlaid with oil from deep offshore, etc. Exxon publishes a outlook of energy industry going out 30 years which shows oil production rising significantly from the 80-90 bbpd today to 100 - 120 bbpd in 2040. Don’t take this wrong but it has to be the best forecast out there. So don’t despair. Peak Oil is coming, it is 30 or 50 or 100 years out. And that is a good thing. The number one thing that would help the world economy and the poorest people all over the world in $65 oil. I understand that happens to be Exxon’s forecast for average price of oil over their planning horizon.